Press F11 to show (toggle) the Paper Roll & Register Window, or select it from the Window menu. 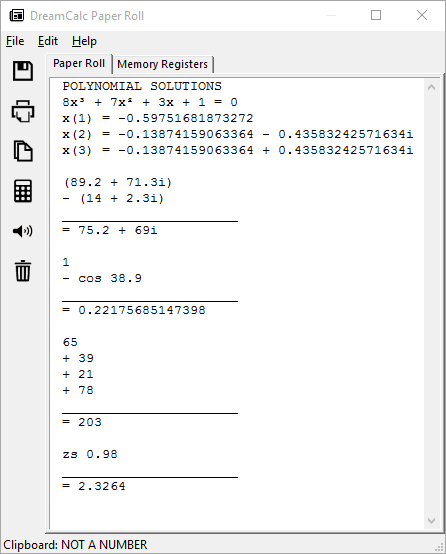 In algebraic input modes, the "paper roll" keeps a historical record of your calculations. It is updated each time you press [ENTER], and the history is maintained between application starts. The paper roll text is also editable, so that you may add your own annotations. It will not keep an indefinite record, however. Eventually the oldest entries will be deleted to make room for new ones, and any notes added will be lost also. In Reverse Polish Notiation input mode, the RPN stack is shown in place of a paper roll. The stack size is configurable from the Options Window. In this mode, the RPN stack is not editable. 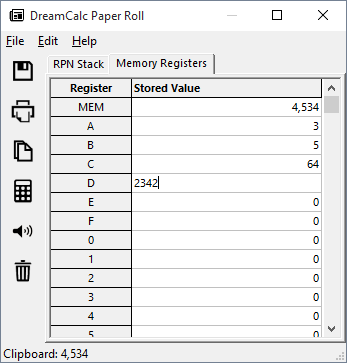 The "Memory Registers" page tab allows you to view and edit any numeric value held in DreamCalc memory. See below, right. Values can be stored and recalled from the calculator keypad using [STO] and [RCL] with keys marked "MEM", "A"-"F" and "0"-"9". Any change to a memory value will be shown in the window instantly. The additional registers "rx" and "ty" are used with the P►R and R►P functions to access result values. The Professional Edition also provides the following financial registers: "n", "i%", "PV", "PMT", "FV" and "K", where the "K" register is used with bond price calculations. Clicking on Edit→Speak Last Input (or the  button) will cause DreamCalc to speak the last input expression. Now in the paper roll window, click on the  button to hear DreamCalc speak your last input. In RPN mode, the calculator will speak the bottom four registers: T, Z, Y and X.